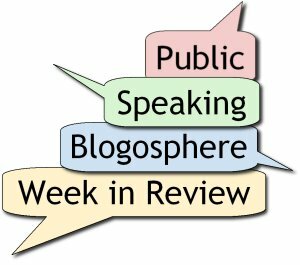 Every Saturday, we survey the best public speaking articles from throughout the public speaking blogosphere. But, given my blogging hiatus, this week’s version is super-sized! the benefits of speech contests. Nick Morgan dissects repetition and gives examples of many forms you can apply in your speeches. Good repetition gathers force as it goes along, because the repeated word or phrase can handle the weight. The repetition becomes memorable as it accumulates emotional meaning underneath the repeated word or words. There are many kinds of good repetition and you should use all of them. Craig Senior gives a 5-step process to speechwriting. Speech writing might be painful for you: perhaps you struggle in endless hours of speech preparation and still wind up with a speech that is unfocused, unclear with a meandering train of muddled thoughts. A speech should look like a poem on the page, not a novel. Also, people use speeches like a bucket when actually its more like a teacup. Johnathan Steele gives 5 principles to enhance storytelling. Identify your most wanted response. This is the basis for applying these principles. Identify the moral, lesson, or motivation the story has to offer. Introduce the story and start to appeal to the emotions of the audience. As you transition into the body of the talk, incorporate the informational, persuasive, or motivational aspect of your message. Reach out to the senses of the listening audience. Finish the story, reinforce the application and conclude with a review the moral, lesson or principle. Terry Gault offers a two-part series on storytelling (part 1; part 2) which points out the importance of authentic, personal stories. Use personal stories to make points. Carefully selected, vivid details are always more powerful than vague, general adjectives. The essential events MUST have happened to you. Otherwise, the story will not ring true for the audience. Should they later discover the story did not happen, your credibility will be damaged. Daily Writing Tips offers tips for adding dialogue to your stories. Olivia Mitchell describes (with words and pictures) nine ways to use the speaking area to complement your message. I rarely say this, but this is a “must read” article. State your key message from the power position. Map your structure on the stage. Argue the pros and cons as if you were in a debate. Physically reflect the continuum of points of view. Give each option its own spot. TJ Walker argues passionately that you need two different slide decks — one for projecting to the screen, and another to hand out (or email) after your presentation. Most business executives would never think to take the text from their newspaper ads and turn that into their TV ads, and yet for some reason we think that text on our computer should work fine projected on a screen a long way away from people. It doesn’t work that way. John Windsor also argues for handouts that are not copies of slides. Sure, it’s easy for you to create handouts from PowerPoint or Keynote, but are copies of your slides what your audience really needs? Probably not. Don’t use PowerPoint at all. Check to make sure you brought your big idea with you. Too breathtaking to take notes. Dave Paradi disputes the commonly held belief that you should limit the number of slides employed. By limiting the number of slides, the organization thinks that it is helping presenters focus their thoughts and present only the key ideas. Nothing could be further from the truth in most cases. My experience is that an artificial maximum number of slides does nothing to focus thoughts. Laura Bergells outlines 6 “touchy-feely” tips for rehearsing your presentation. Rowan Manahan follows up on TJ Walker’s article to combat the excuse that rehearsal leads to stale delivery. Your audience doesn’t know, realise or care that you have put 40 hours of rehearsal into your one-hour talk. They don’t know, realise or care that you are gritting your teeth with frustration and boredom when you deliver your seemingly off-the-cuff humorous asides. But believe me they will very quickly realise if your delivery falls short of the mark; they will immediately know if you keep turning your back on them to read from the screen; and boy will they care if they get any sense that you are underprepared. Olivia Mitchell gives techniques to establish your credibility. So how can you avoid setting off the braggart alarm bells of your audience while still establishing your authority to speak on the topic? Andrew Abela provides a two-article series (part 1; part 2) about presenting to venture capitalists. The content of the pitch and quality of the team are far more important than the quality of the presentation. John Kinde encourages all Toastmasters to enter speech contests. The only people who lose are those who don’t compete.